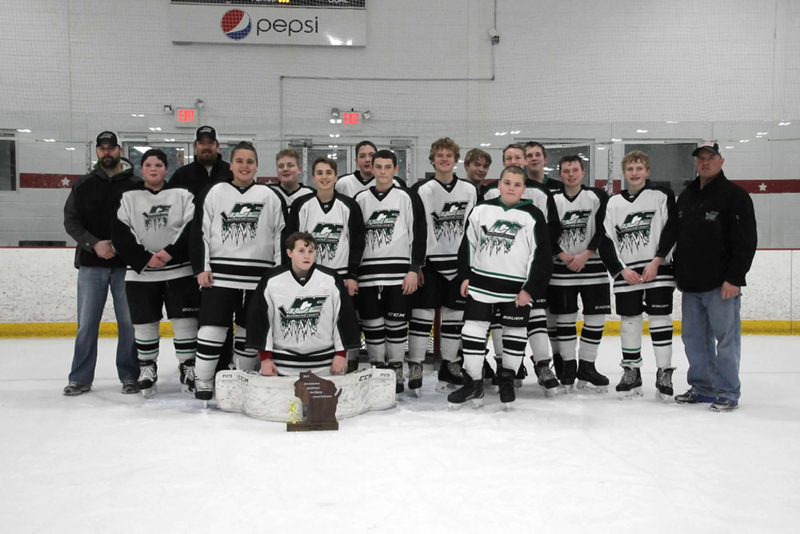 The Washington County ICE Bantam B team earned second place at the State Tournament this past weekend. The competition started on Saturday, March 2nd and the Washington County ICE Bantam B team’s first opponent was Janesville. Carson Phillips (Tyler Bartz assist) found the net in the first period placing the Washington County ICE in the lead. In the second period Washington County scored three more goals pulling ahead to 4-0 at the end of the second period (John Pfaff-Bartz assist, Tyler Bartz – Pfaff assist, and Bartz again – Pfaff assist). In the third period, the Washington County ICE team piled on three more goals with one answering goal from Janesville to prevent the shutout (John Pfaff-Phillips assist, Ethan Schickert – Dexter assist, Stone Daczka – unassisted). Washington County ICE then moved onto the second round against the Oregon Bantam B team. In the second game of competition, it was a fierce battle. Oregon was first on the board before the end of the first buzzer with a 1-0 lead. The Washington County ICE battled back with two unanswered goals pulling ahead with a 2-1 lead by the end of the second period (Ethan Schickert unassisted and Tyler Bartz – Quinn Daczka assist). The game gained intensity as Ethan Schickert added one more to the score for 3-1 lead, but Oregon began to mount a comeback late in the third with a second goal. Both teams battled for control of the puck with Oregon pulling the goalie to try and tie up the game. The Washington County ICE successfully defended itself though and won the game 3-2 to move on to the championship game. Alex Champeny, the Washington ICE’s outstanding goalie, made 30 saves out of 32 shots in the game. The final championship game match up was against the always tough Fox Valley Blades. It was quickly clear the Blades were a very fast team and came in hot out of the gate. Fox Valley’s offense rocked the ICE back on their heels by scoring two goals in rapid succession early in the first period. They added a third goal before the buzzer, but Carson Phillips lit the lamp for the ICE before the first period ended. Fox Valley continued their offensive onslaught finding the net three more times in the second period denying the ICE from any scoring opportunities despite numerous shots on goal. In the third period Corbin Dexter attempted a rally for the ICE team finding the net, but the Fox Valley blades added another two pulling further ahead. Carson Phillips lit the lamp one last time, but the Washington ICE came up short in the final game losing 3-8. Overall a great effort from the Washington County Bantam B ICE team and congratulations on earning 2nd place finish in the state tournament !